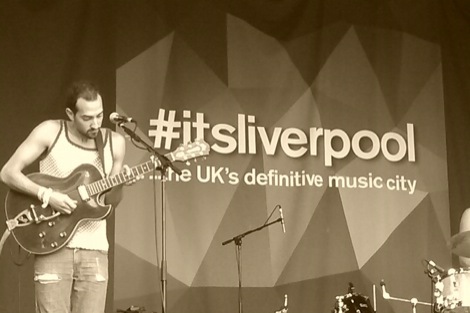 Merseyside’s best new music was on offer at LIMF and Getintothis teamed up with Bido Lito! and Sound City to showcase some home grown diamonds. Sean Bradbury, Peter Guy and Joseph Viney round up the action. Organisation is one thing, but sometimes you leave your fate in the hands of whatever malevolent god you pray to. Well, somebody must have been praying to the mighty Ra in the build-up to the Liverpool International Music Festival (LIMF) because by jove it was warm. So warm in fact that Getintothis was left a little red-faced by the end of the weekend, and for once not in embarrassment as a result of some alcohol-led mishap. Sefton Park was home to the It’s Liverpool stage and for a display of the versatility on offer within the city limits, you needed to look no further. Sunday’s stage was a joint curation between Getintothis and Bido Lito!, and a healthy range of new and established artists play to a content and rather sweltering crowd. One of the finer sights was seeing a very mixed crowd. Regular gig goers will no doubt be accustomed to drainpipe musos, chin strokers and arm folders loitering at the back. So it was heartening to see young and old, people from all over the human spectrum come together and just enjoy some music. One of the first sights and sounds of the afternoon was the rather intimidating Bonnacons of Doom. A very high percentage of human communication is non-verbal, and if the sight of three warriors in long white robes with their heads bowed didn’t give you an idea of what was about to come, then the warped wall of noise they created from the first note should have done it. Recreating the sound of mega-doomy Sunn O))) and, closer to home, shades of Conan, the Bonnacons (the work of Liverpool-based arts collective HIVE) felt almost like the bleeding of a bad dream into a pleasant one; imagine strolling through a sunny valley full of rainbows and love only to find…ARGH…you’re naked and your old schoolmates are present and laughing at you. It’s jarring, but it keeps you guessing, on your toes. Infusing distorted layers of sampled vocals, pranging textured guitar which alternates between post-industrial thunderslabs and thick Hawkwind washes all cocooned amid Sam Wiehl‘s tempered percussive taps the result is hypnotic yet engaging and almost ridiculous given the Sefton Park sunshine and the toddlers dancing down the front. Just imagine the hell vortex they could summon in a dark room on any given night. The Loud bounced onto the stage next and well, lived up their name. A dimension away from the preceding group, The Loud deal in a more shiny guitar-pop sound. If we sound disparaging, then we don’t mean to be. As noted above, the beauty of the day was the range of options on offer and The Loud’s own brand of sunny music was perfect for the surroundings and a wonderful contrast with the Bonnacons. Finishing up with a Beatles‘ cover (Revolution), The Loud played to the gallery and wouldn’t look out of place on anybody’s wall. We learn afterwards that this was to be the lad’s finally show with new material, a new direction and a new name all in the offing – intriguing times ahead. Merki is a proposition like few others in Liverpool. 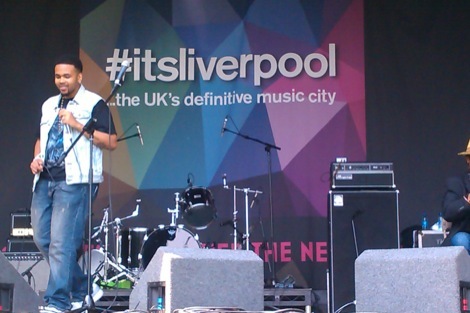 Rapper, singer, producer but ultimately pop artist with a vast palette and Sefton Park is his canvas to exploit. Flute loops skip between drum pad squelches and dense beats yet it’s all underscored by a catchy sensibility which is both infectious and moreish. He closes by introducing a female lead who threatens to steal the show with a lung-blasting vocal which is rich yet leaves out stereotypical RnB gymnastics. It’s the first time we’ve been entertained by the two of them, we’re looking forward to the next. GhostChant was, again, an entirely different proposition altogether. There wasn’t much in the way of stage action given that it was one chap and a whole host of twiddly, alien-esque electro-gizmos but his smooth mixes, hushed beats and ghostly vocal additions were just the ticket. No doubt it helped with that post-sunstroke glow everybody was starting register. His sun-kissed beats leant themselves to the laziness abounding around the park, and closing with his calling card – a reworked Foals Spanish Sahara – and it was almost all too much as we drifted off into another dimension. Ady Suleiman continued his meteoric rise with a typically stripped-back display that still contrives to combine soul, hip-hop and funk into a neat little package. Following his debut Glastonbury performance on the Introducing Stage, the Nottingham-born singer is due to be a name on everybody’s lips in no short order, and his set of youthful, incisive and at times lovelorn songs on this day will no doubt have brought more people onto this side. All We Are drenched the park with a sound which was as time-defying as it was timeless. Their liquid-like vocals, gentle psychedelic guitar lines and fuzzy bass seem to stretch the seconds out as they fill the gaps with gauzy grooves and heavenly harmonies. A blissful half hour to sink into and float along, closing with the seductive flavour of Utmost Good, leaving a high and hazy lingering after-taste. Saturday’s billing saw Sound City leading the curation with the emphasis on rock and roll. The Dirty Rivers are a fantastic live proposition; crunching chords, swivel-hipped vocals reminiscent of The Music‘s Robert Harvey and blistering solos. 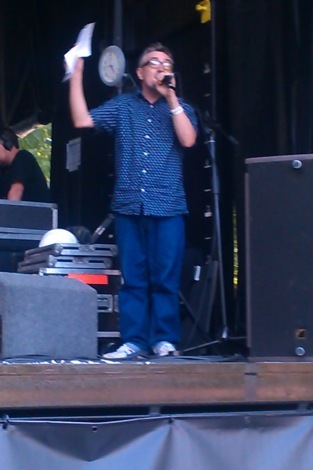 They also hold some of the swagger of groups like the Stone Roses courtesy of some excellent drum patterns. It’s great to see an old-fashioned clattering rock and roll group make a noise. More power to ’em. Bird are regular fixtures in and around the city and another prominent placing on Saturday’s bill was a testament to their growing power. Their set at dusk at FestEVOL became allied perfectly with their atmospheric, magical sound but here a big stage and too much sunlight conspired to hinder them slightly. That’s not to say they didn’t put their usual exhausting shift in; their audience had their heads turned almost immediately but this time the hot sun wasn’t really welcome. Damned if you do, damned if you don’t. Much like Bird, Tea Street Band can seem to do no wrong in the eyes of fans and promoters. A slow but steady rise to prominence has occurred for these lads and with good reason. Their high-energy blend of dance-led numbers, powerful drive and at times far-flung vocals is a winning combination and the evidence as to why they are on the up is right in front of you. Usual blockbusters like Disco Lights, Summer Dreaming and Push The Feeling On struck the right chord with a bustling home support. Job done. 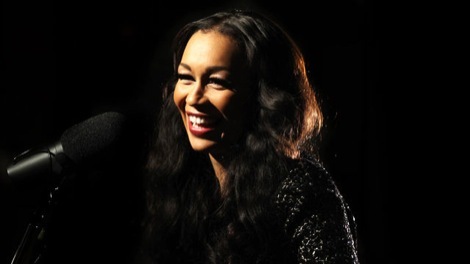 For a comprehensive review of Liverpool International Music Festival 2013 visit here. All We Are at Getintothis‘ Inner Visions at FACT. 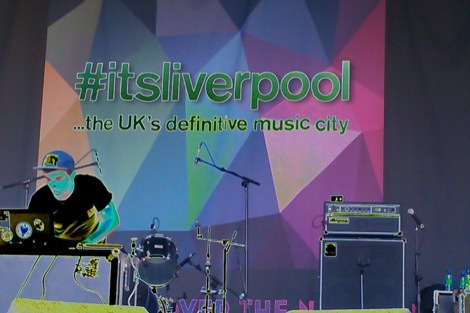 Getintothis reviews All We Are at Liverpool Sound City 2013. 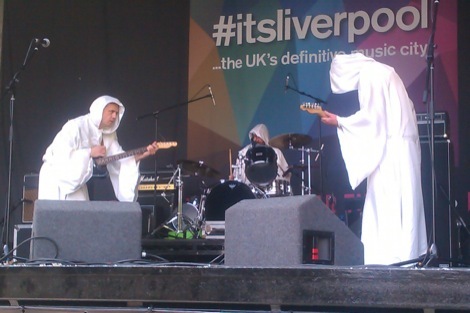 The Bonnacons of Doom at Liverpool International Festival of Psychedelia. GhostChant live at The GIT Award 2013. The Loud reviewed live at Liverpool Sound City 2013. Merki reviewed live at Elevator Bar. 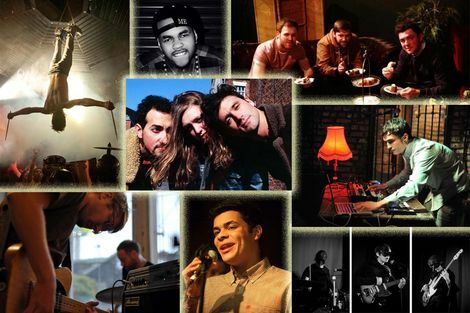 Ady Suleiman named in Liverpool Sound City 2013 top 10 bands of the festival.